Traffic is bad all over Metro Vancouver, but the worst spot to emerge in the last several years is the bridgehead at the Second Narrows in North Vancouver. 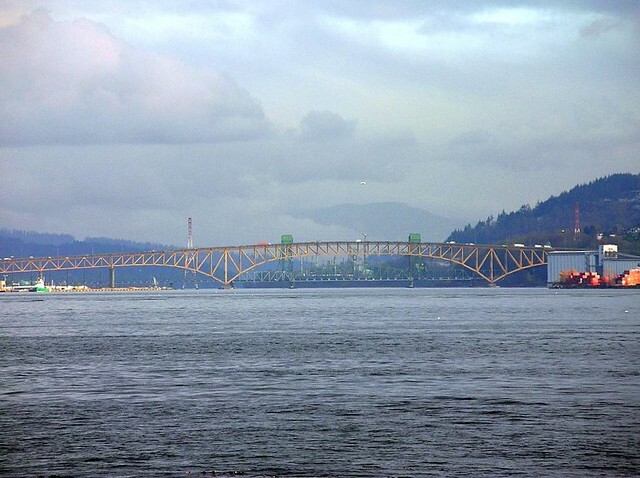 Municipal leaders were told in 2015 that the North Shore’s woes coincided precisely with the expansion of the Port Mann Bridge to 10 lanes in 2012. Well municipal leaders have been told, many times, that the region was headed for worsening traffic and congestion problems for much longer than that. In fact I have the feeling that I have written this blog post many times now. I was employed on the issue between 1997 and 2004. Back then, when we were sent across to the North Shore to listen to their complaints about transit – and ideas like a third crossing or a SkyTrain extension in a submerged tube to Lonsdale Quay and then up Lonsdale in tunnel – we said that the North Shore was not part of the Growth Concentration Area (GCA), and that since population was therefore not expected to grow there in large amounts, there were other areas where increasing transit supply was a higher priority. The GCA was part of the Livable Region Strategic Plan (LRSP) – and its transportation counterpart, Transport 2021. That said that we were going to build a compact urban region of complete communities that would protect the green zone and increase transportation choice. We didn’t stick to that plan. The province of BC did sign on to it, but then steadily undermined it. And the LRSP eventually gave way to the present Regional Growth Strategy. The other neighbouring regional plans, designed to prevent them becoming exurbs of Greater Vancouver, were also largely ignored. The freeway widenings and new bridges were the recipients of huge sums from the province, and were never subject to a referendum. Bridge tolls were unpopular – and explain why the Port Mann line in this chart goes down while the Alex Fraser goes up. Given the investments made in widening Highway #1, “improving” the Sea to Sky, building the South Fraser Perimeter Road and the Golden Ears and Port Mann bridges, it is hardly surprising that most development in the impacted areas has been car oriented. Transit developments have been concentrated in the part of the region that already had pretty good transit service. Transit Oriented Development – like that in Port Moody – either didn’t happen or was ineffective due to the lack of workable transit choices. The West Coast Express, being limited to weekday only peak hour direction only, just benefitted a those commuting to downtown Vancouver – the one area where employment growth had been sacrificed to condo development. In fact the Vancouver Sun article doesn’t talk about transit at all, except for one mention about bus routes needing to catch up. But there always were options that could have been chosen, if the LRSP was to work as intended. The Millennium Line need not have been quite so useless: it could have been the full T line anticipated in Transport 2021 – UBC to Coquitlam with a branch to New Westminster. It would have had to be surface LRT, as originally intended to be built for the same price. SkyTrain could have been extended in Surrey. Passenger rail service could have been retained (and enhanced) to Squamish, Whistler and beyond and some better use made of the former BCER right of way to Chilliwack. LRT was entirely possible on routes like the Arbutus Corridor, with connections to the airport, and along the Riverside development area where CP has a somewhat redundant freight line along Kent Avenue all the way out to New Westminster and the TriCities. 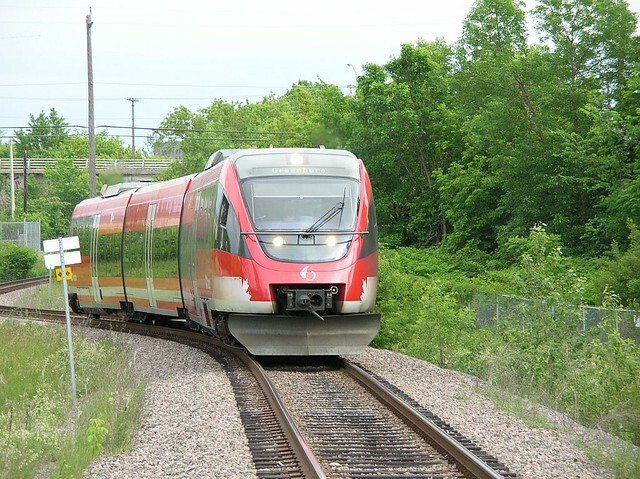 Sharing tracks between freight and LRT is entirely feasible as demonstrated by the Ottawa O train. Translink might well have introduced its now highly successful #555 from Braid to Langley much sooner by the simple device (used for Delta and South Surrey express buses on Highway 99) of converting the hard shoulders of Highway 1 to exclusive bus lanes. There was no need for all those lanes on the Port Mann bridge – which is now carrying less traffic – as the congestion was only on the approaches. A bus across the bridge connecting the city centres of Surrey and Coquitlam would still provide much more convenient and direct service than SkyTrain does now. The present BC Liberal administration has shown that it does not support increasing transportation choice. It shows that it is stuck in the 1950s mindset of continually increasing highway capacity, which never ever satisfies demand for very long, and always provides more opportunities for more expansion plans. And that suits the corporations and the property developers who keep on doing what they have always done – which includes large donations to the political party that made it so profitable. Not livable. Not affordable. Not sustainable. And building another massive bridge between Richmond and Delta will not change that. The problems on the North Shore won’t be solved by upgrading interchanges either. And a Third Crossing doesn’t seem any more likely than in the last thirty years. Maybe the Mayor’s Plan to expand transit will help, but, as the North Shore Mayors recently acknowledged, there is not a lot in there for their area. Looks like they are going to need a lot more transit!